﻿ Hosting Emails - Do Email the Right Way! Pay only for the mailboxes and features you need, which allows a more efficient use of resources. Login to our Hosted Email Platform Today! Trusted by over 4 Million Active Users Worldwide. Login to our Control Panel and Create the Users/Mailboxes. Bulk Creation Tool is also available or we create them on your behalf. Modify your domain MX/CNAME records to your new Hosted Email. You can point as many domains you wish to host with us. Inform your users to edit their Email Account in Mobile Settings and all their other devices. Join our Email Platform Today. Contact us anytime 24/7 for any assistance. It is common for businesses to outsource their sales staff, their web design, their marketing and PR. However, it can also be beneficial to outsource non-human aspects of a business such as Your Email. For firms that find they are increasingly spending far too much internal human and IT resource on managing their email, it can be difficult to determine the actual costs of providing email service in-house. Hardware and software for redundant email, anti-spam and anti-virus servers. Additional web and application servers for web-based email. Redundant (mirrored or RAID) storage for mailboxes, with sufficient capacity to meet near-term storage requirements. Ongoing server and storage upgrades to support growing usage/volumes of data. Ongoing staff costs in server, security, email administration and technical support. In addition, you will need the necessary data center infrastructure, including network bandwidth, power supply and rack space as well as dedicated IT staff. Outsourcing the email service gives you better control over the expenses without requiring the infrastructure from your end, eliminating these up-front capital expenditures; you pay a service fee based on the number of mailboxes and features when you need. Your true costs are always known, fixed, and predictable. One of the most common challenges businesses face is a deviated focus from their core operations. Because their time and investment is spent on tasks that could have been better managed by specialists. Running a highly available email service requires a good deal of dedicated staff time. Even if you are using existing staff to perform these functions, you will be diverting time from their primary job function of providing the services on which you have built your business. Outsourcing your email gives you a chance to focus on your business' unique selling proposition and outplay your competition while you leave the heavy lifting of emails to a trusted partner. For every business, data is a valuable resource. Most startups and small businesses aren't prepared for recovery from disasters. Data loss can bring any company's operations to an indefinite halt. If you plan to offer a high-quality, highly available email service in-house, you need to minimize all downtimes, both planned and unplanned. Doing so requires an email infrastructure with redundancy and failover capabilities that protect the service from individual failures, deployed on a fault-tolerant network. The mailbox storage must be redundant. The platform needs full backups of all email data, with offsite storage to protect from a site-wide problem, and the ability to recover data rapidly in the case of failures. Building such an infrastructure takes both time and expertise. The email that passes through a business is essentially its life blood; if anything were to go wrong then sales could be lost, competitors could discover confidential information, jobs could be lost and the whole future of the business could be severely compromised. When the perceived risks are as high as this, then the usual human response is to take no action. The attitude is frequently that the business is getting along fine, though less efficiently that it might be, so why take any unnecessary risks? It is a case of "if it's not broke, then why fix it?" The problem with this attitude is that the risks are overstated. It is correct to study the risks involved and there is no excuse for avoiding due diligence, but the evidence shows that when organisations outsource their email, they enjoy improved security rather than the converse. The email threat landscape is changing regularly. Viruses, directory harvests, denial of service attacks, mail bombs and other forms of spam dominate the list of threats. And the virus landscape changes regularly as well, requiring constant updates to anti-virus signatures. Spam is costly in terms of bandwidth and storage, while viruses can easily overload and shut down your servers. Spam protection and security require a multi-layered defense with constant signature updates that do not impact quality of service. Spam and malware are not problems you solve only once, you need to dedicate resources to the fight on an ongoing basis. Your email service must keep pace with changing user expectations. Upgrading servers to the latest models can potentially be the greatest email-related expense that companies face, especially at the speed which digital technology is currently moving at. If you are providing email in-house, you have to keep investing time and effort into the email infrastructure and upgrades - and rolling out new features without disrupting service or reliability. Keeping current with changing technologies is part of what we do. We take care of the engineering behind the changes and implementation of new feature roll-outs. 7. Did we mention Compliance? If you have business customers, you have to consider compliance issues. Industry-specific regulations specify data security, availability, protection and retention requirements. Your email system will need to support these requirements. Here again, outsourcing your email with us ensures that we are investing the resources to do this, not your own internal staff. 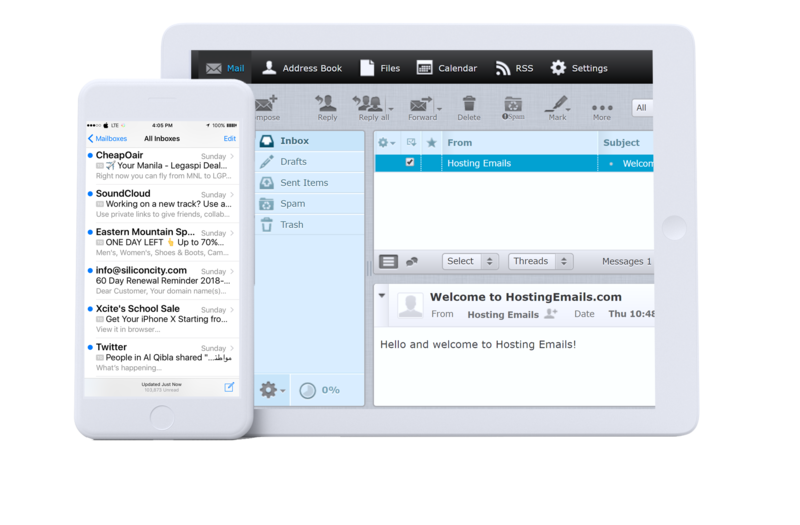 Over 4 million users worldwide use and trust our customizable, affordable and high-performing Hosted Email solution.